Connect to Thermocouple types: B, C, D, E, G, J, K, N, R, S, T.
instruNet also connects directly to: Voltage, Thermocouple, Thermistor, RTD, Load Cell, Strain Gage, Current, Resistance, Accelerometer. Analog and digital I/O cards enable one to create an 8 to 256 channel measurement system. Cards easily plug into a 4, 8, 12 or 16 slot card cage that communicates with Windows computer via USB 2.0. Free instruNet World strip chart recorder software supports Windows XP, Vista, 7 and 8 (32-bit or 64-bit). Compatible with LabVIEW, DASYLab, C and Visual BASIC Software. Digitize any combination of channels at 166,000 samples per second aggregate. Reduce noise by placing i4xx cards near sensors and up to 100 meters from noisy computer. i51x wiring boxes easily attach to i4xx series cards. Install instruNet hardware and software, as described here. * add jumper wire from instruNet_Vin- to instruNet_GND. View measured value in the lower right corner of setup dialog, or Network page. Apply stimulous to sensor. Does value look correct? If not, click thermocouple troubleshooting. 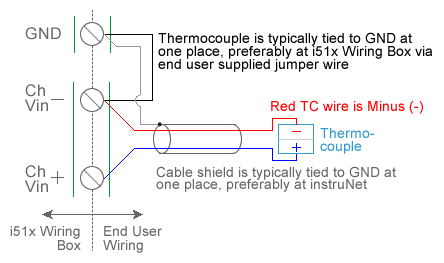 For more information on setting up sensors, see how to connect or working with thermocouples. Digitize waveforms, as described here. Save your settings in a .prf file by pressing the SAVE button in the NETWORK page (not record page). To get these back, click OPEN in the network page. To further learn how to use instruNet, click software tutorial. To learn about instruNet products, click here.